A classic example of how a companies personality doesn’t always transfer with the sale of the company. 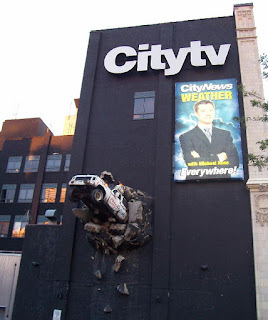 Every morning on my walk from the subway to work I walk by the CityTV building and the two things I check out every morning are the Jeep coming out of the wall and I usually take a peek in the window of Breakfast Television. I have always loved the Jeep and thought that it was a great symbol of the maverick attitude of the early days of CityTV. If you are wondering why I am referring to the Jeep in the past tense it is because BlogTO is reporting that since BellGlobeMedia bought Much Music and the building there have been signage changes and that there is a rumour the Jeep is coming down tomorrow (July 3rd). I get the fact that the Jeep is a CityTV thing and that they are probably moving out of the building but an argument can be made that the Jeep is also a Queen Street landmark and should be preserved as is….no matter who owns the building.